What is a clock's most important element for telling the time? Right, the hands. And that's what the Wyzer clock is all about, green hands. The hours aren't there and you have to add them in yourself. Yet, you have no trouble telling the time. LEFF Amsterdam is renowned for the unusual clocks they design. But this Wyzer wall clock is really special. 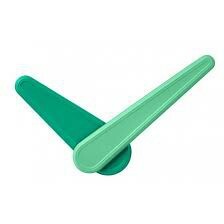 Reinhand Dienes must have been thinking "less is more" when he designed this clock. It only features the most essential element, the hands. Suddenly, it strikes you that you really don't need the clockface in order to tell the time. 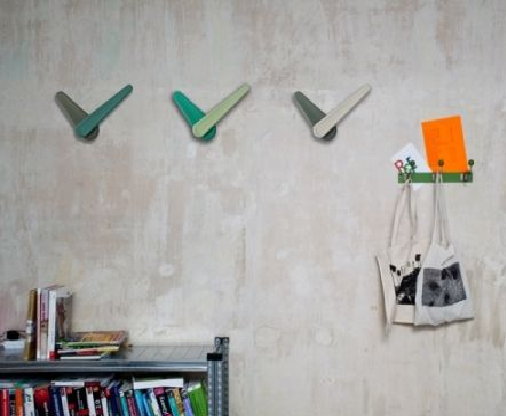 And thanks to the clever design, the whole wall can become a clock. All you need is 60 cm free space to place it on your wall. This LEFF Amsterdam wall clock is not only uniquely styled. It is also consciously designed. Using a German timing (UTS), this clock never loses time. In addition, the material used is the same as in PET bottles. All those empty Coke bottles have found a great new use. 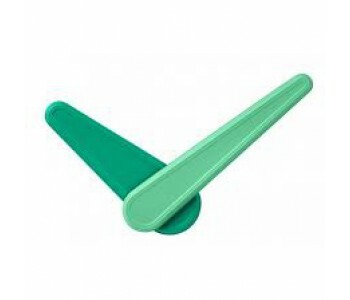 And the material ensures that the clock is very light and thin. This one has green hands, but there is also a grey version.